Daemons Domain - All Souls Trilogy & Universe Fan Site + Podcast: Countdown to AllSoulsCon! Our whimsical guess as to what a modern creature publication might look like! As most of you know, we are going to be at ASC! We've also been honored by being selected to present the fan panel this year! 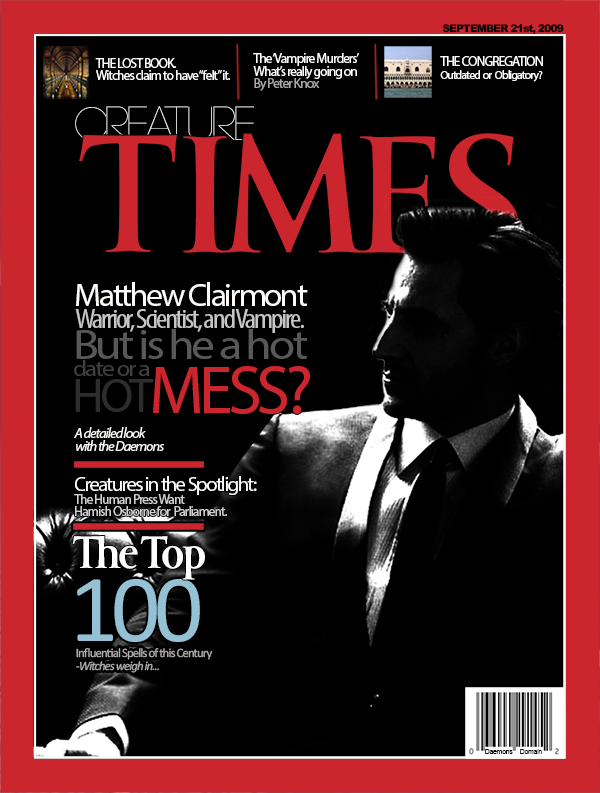 The subject, Matthew Clairmont: Dream date, or a hot mess? Well, we suppose it depends what you are looking for in a man who happens to be a vampire! There's much to talk about, and we would love to chat with you about it at AllSoulsCon! So what do you think? Do you find Matthew Clairmont an ideal mate? Get yourself a pass (virtual or actual), and let's discuss this! It's not too late to buy your tickets to AllSoulsCon*. You can purchase them up to the morning of the 12th of September (9 am, Pacific). If you haven't heard of it, AllSoulsCon is a one-day nonprofit convention celebrating Deborah Harkness‘s masterpiece, All Souls Trilogy. You can go in person, or stream live from anywhere! To all of you who cannot attend in person, that's ok! We know for a fact that there will be exclusive features and prizes just for the people steaming online! We heard a whisper that Deborah Harkness will be offering her own foreign editions of the Trilogy (signed!) 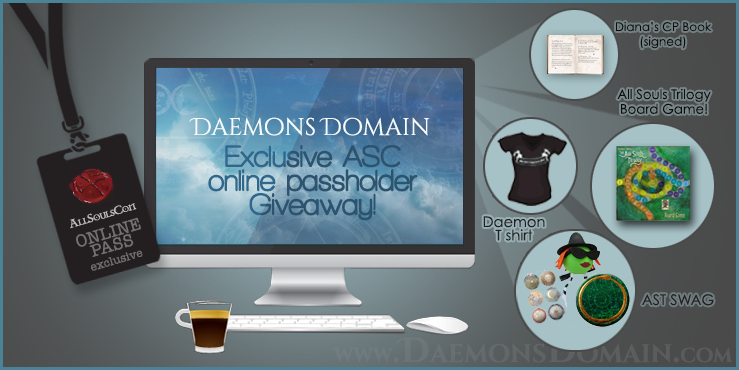 We Daemons will also be offering a chance at a prize package to all virtual attendees! * A collection of AST SWAG! - Sarah's antenna witch topper, a set of 6 alchemical buttons, 1 ouroboros mirror! AllSoulsCon will provide you with a password to the AllSoulsCon Online area of their site after the purchase of your online pass. The link to this giveaway is on that page (look under 'online contest sponsored by Daemons Domain') - follow that link. Use the same password you used to access the AllSoulsCon online page to enter our giveaway page! Voilà! You are there! You have to be in it to win it! (ok, we know...we know. That's corny. But it's still true!). This will be the very last of our 2015 summer giveaways (whew! We need a little break! ), but keep an eye out...Halloween is coming! Anyway...we know that attendance is not always possible and/or practical with schedules, airline/hotel/rental car prices etc. We had the same concerns, but we were very fortunate that the stars just happened to align in our favor this year. But please know that we DO understand, and we hope this exclusive prize for virtual attendees will dampen the woe of not actually being there! So get your online pass, and we'll virtually see you soon! Or if the stars align for you, go ahead and get a pass, show up, and we'll actually see you soon!